Apply to containers three-color and four-color. I do not give instructions where in which the chamber is what color. What else but black cartridges are individually then there is no problem with filling. Black ink containers are small holes in the vent point A (see photo below), the holes with a larger diameter and just slightly peel off the sticker which is affixed to the container, and we have access to vent. Through this hole putting / inserting the needle of a syringe filled with black ink to a length of 1/3 the length of the needle and push the plunger to fill the syringe with ink until the ink starts to show up in the vent hole. Then stop the ink injected into the container and do the opposite sucked from the container the excess ink from 1ml to 2ml so that when working container-head does not occur in a discharge of ink, and we do not dirty the print. After filling the container with ink, gently wipe the cartridge nozzles facing the paper on which we print. So gently touch the container to lying on a flat surface of the paper and gently press against getting rid of the ink leaking from the nozzle to the surface was dry with no ink particles. Caution! 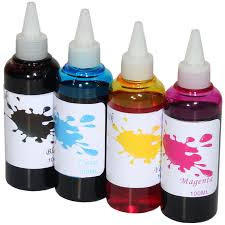 - Activities carried out during the refilling ink cartridges do not touch the walls on which are placed the path of copper foil, these are electrical contacts connecting the printer to the head / nozzle in the tank. If we find that they are soiled with ink to paper towels or toilet paper gently, trying not to touch with bare hands, dry the contacts with dirt.